Born Saleva’a Fauali Atisano’e, Konishiki Yasokichi was the first foreign-born sumo wrestler to be named champion or Ozeki. Konishiki won his first 11 matches as an amateur athlete in the Japanese sport. He left after more than 15 years with the Sumo Association and started his own business as a marketing professional, publicizing his persona through television. Konishiki has appeared in several TV advertisements for Japanese companies and products. He is also an established recording artist, debuting in the music scene in 2000. All of Konishiki’s successes are put in to good use as he strives to uplift the lives of not only his family and relatives but also the hundreds of children who are on the verge of losing hope at such a young age. Konishiki founded the Konishiki Kids Foundation to mentor and guide disadvantaged children towards the right path. One of the main philosophies that the foundation wants to put forward is the idea that children have a “choice”. JEFF KLECK and WAYNE MCVICKER - Co-founders of Neoforma and Attainia Inc. Greater Good Radio highlights Jeff Kleck and Wayne McVicker, founders and partners of Attainia Inc., an Internet-based management company dedicated to improving the management of the capital equipment lifecycle in healthcare. 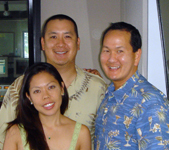 Prior to Attainia, Jeff and Wayne also successfully founded and ran Neoforma, the nation’s first significant Business-to-Business online marketplace for medical supplies and equipment. The partners draw their knack for entrepreneurship from their creativity, flexibility and focus, and as they walk along the path of success, they bring with them a sense of charity and oneness with the community. 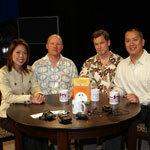 From zero revenues, Dean McPhail and Greg Meier hit the one million dollar mark in 2005 nine years after introducing Jamba Juice and Starbucks to the state of Hawaii. Dean and Greg hold exclusive rights to the two brands for their Hawaii operations, all thanks to their persistence and determination. For more than a year, the partners had been dealing with Starbucks International who was at the time steadfast in their stand of not giving out franchises for their brand. Eventually, after realizing their goals and objectives, Starbucks executives gave Dean and Greg the green light to establish the brand in the State. 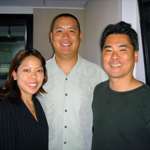 Roy Yamaguchi is one of the world’s most famous and successful chefs and restauranters. 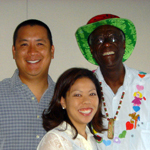 Roy was the first Hawaii recipient of the James Beard Foundation Award and was featured in Forbes Magazine. Using his local roots and worldwide experience, Roy has put together a world class business. He’s an author of numerous books, appeared on TV and has his own line of designer cookware. Kenwei Chong had an once-in-a-lifetime adventure he wants everyone to experience. Wanting to take a break, Mr. Chong flew from his job as a financial manager to the other side of the world in 1996. His four-month trip to Southeast Asia has become a 15-month long adventure. 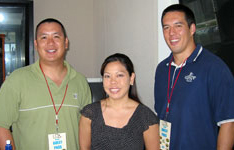 With web visitors expected to top 1 million in the next year, Gail Jennings shares with us how she built HawaiiDiner.com into a viable social enterprise. Gail successfully implemented a social mission after inspiration from Greater Good Radio and her revenue doubled in a short period. Hear Gail’s story of how you can build a business and make a difference. 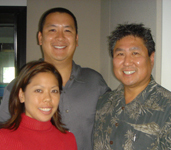 Chef Alan Wong has opened 4 successful fine dining restaurants in the past 9 years, all one year apart. So how does Alan Wong’s Restaurant remain at near capacity every night? Chef Alan shares his early days as a dishwasher to apprenticing at the #1 restaurant in the country prior to starting his restaurant chain.